'To one established in non-stealing, all wealth comes.’ ~ Sutra 2.37, The Yoga Sutras of Patanjali. Have you ever borrowed something from somewhere or someone and not returned it? Have you ever been on your social media or personal phone while at work? Have you ever been late to work? Have you ever presented someone else's idea as your own, or taken credit for something you didn't do? Have you ever copied music from a friend's CD or MP3? Have you ever been on your phone scrolling while someone was talking to you, or while you were eating? Have you ever been late to an appointment or meeting? Have you ever overworked and found the next day you're too tired to enjoy the plans you'd made with a friend or family member? 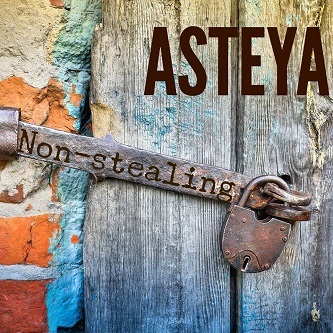 Throughout the month we'll be stepping away from the assumption that stealing must be of a physical item and look at the more subtle ways that steya/stealing can happen in our daily lives. Whether you're near or far, we look forward to sharing this practice with you! The final agreement in The Four Agreements, and our final week focusing on satya/truth is 'always do your best'. In a perfection-seeking society this agreement can be one of the most liberating. This agreement requires the application of satya to discover and practice the truth every day. In the book Don Miguel Ruiz says; 'under any circumstances, always do your best, no more and no less. But keep in mind that your best is never going to be the same from one moment to the next.' I understand that if you're working on aircraft engines, or you're a doctor, nurse, surgeon etc, perfection is sometimes required! In this practice I'm referring to our every day lives – our yoga practice, routines, interactions with others, home-life, and 'perfection-not-required' work. When applied in our yoga practice, always doing your best is the practice of the yama satya (truth) and the niyama svadhyaya (self-study). We change day to day and our practice should reflect this. Some days we are well rested, energized or relaxed, other days we are tired, sick or frustrated. A 6am practice may look and feel very different to a 2pm, 6pm or 10pm practice. Our best on the mat is altered by our mental, emotional and physical state. Rather than stressing ourselves with an idea of perfection, it's important that we are kind to ourselves in our practice and commit to doing our best at that moment, knowing it's different day to day, and even hour to hour. When you make the commitment to doing your best, you can move out of a perfectionistic, results orientated mindset and find contentment in whatever arises, knowing that you have done your best. This week, both on and off the mat, continue your practice of satya by noticing if you are doing your best. Do not be afraid to be truthful to yourself about the times you are not doing your best and be aware of how not doing your best makes you feel. Please also remember that your 'best' is not a set bar or goal; it changes day to day depending on your energy, emotions and physical body. Practice this agreement alongside self study and know and accept that your best today may not be the same as it was last week or last year. This will lead you towards the second niyama; contentment. How often do we define ourselves by how we feel in any particular moment? How often does the internal chatter of our minds say 'I'm not good enough', 'I'm too fat/thin/short/tall/lazy/loud/quiet', 'I'm a bad person because I ...'. Worse, how often do we define ourselves on the judgments and words of others? 'she said I can't sing, it must be true' or 'they don't like my haircut; it must be horrible'. When we define ourselves by our emotions and the words of others, we step out of the practice of satya/truth. Why is it important to explore the truth? Take the example of being told that you can't sing. Maybe you really can't sing; perhaps that is the truth. Or maybe you can sing beautifully but the person that said those words had a headache in that moment and really meant to say 'please be quiet'. If we don't explore our truth and stand by it, we can allow the comments of others to become a belief in our minds and affect our internal dialog and future actions. Some of the beliefs we have about ourselves are deeply rooted in things said to us as children, and others change day to day, almost moment to moment, depending on our experiences and interactions with others. There is a phrase in sanskrit 'chitta vritti', which translates to 'fluctuations of the mind'. In order to begin calming the chitta vritti we must identify with the truth rather than with our ever changing emotions or the opinions of others. As we become firmly established in our truth we can be more confident and calm, rather than riding a rollercoaster of emotions. This week, as we continue to focus on satya, practice being aware of the fluctuations of the mind. Notice if you have firm beliefs of yourself or others that may not be established in the truth and take the time to explore the truth. Become aware of how often you allow the words of others, or your own emotions to cloud your beliefs and lose sight of what is true for you. Set the intention each day to practice satya in your thoughts, words and actions both on and off your yoga mat. 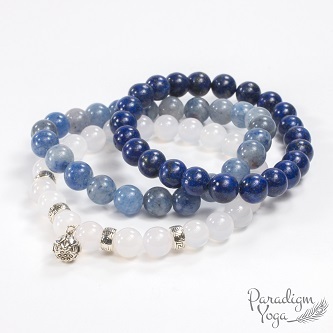 If you're inspired to carry on the work of satya (truth) and the practice of being impeccable with your word, you may be inspired to wear some lapis lazuli. Known as a stone of truth, lapis lazuli enhances communication, and is a stone of friendship and harmony in relationships. It promotes self-awareness and acceptance. It encourages the wearer to be honest and compassionate when dealing with others. 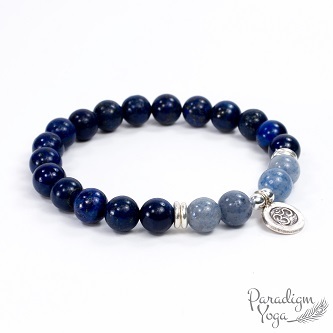 Lapis lazuli is a powerful stone for enhancing intellectual ability; a wonderful stone for enhancing memory, it stimulates the desire for knowledge and understanding. 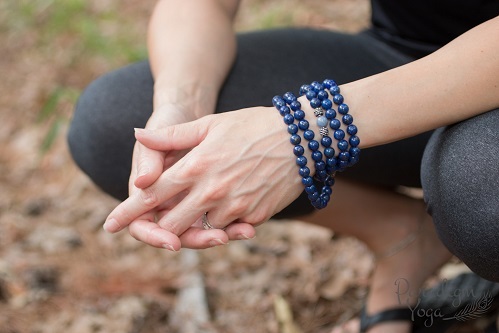 Meditating with lapis lazuli encourages images to form in the mind rather than words, encouraging a higher awareness. All the designs shown below are available in our online store and in the studio. For different sizes or styles, please contact us for a free design consultation.